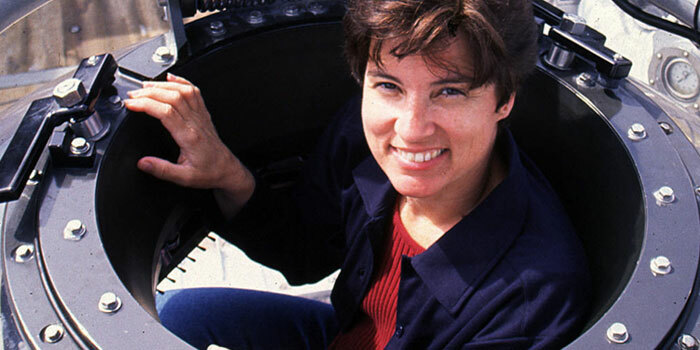 Dr. Edith (Edie) A. Widder is a former senior scientist at Harbor Branch Oceanographic Institution and co-founder of the Ocean Research and Conservation Association. Read the full text of Edie's interview below to learn more about her job. Hear Edie talk about her job, using submersibles to study marine life, and trials and tribulations of life at sea. Download (mp4, 188 MB). CEO, President, and Senior Scientist at the Ocean Research and Conservation Association (ORCA). At the Ocean Research and Conservation Association, an organization that I co-founded in 2005. Yes, for scientific meetings and for research expeditions. What are the educational requirements for your job? I have a Ph.D. in neurobiology, which probably isn’t what you’d expect based on the kind of work I do. I intended to study the neurobiology of marine organisms, but then I got an opportunity to make a dive in a submersible and I became completely fascinated by bioluminescence. I had to learn a lot of new material to change the direction of my research, but that’s the wonderful thing about being a research scientist – you are always learning new things. What is the salary range for someone with your type of job? After completing a PhD, postdocs make $20,000 - $25,000. With each rung up the ladder from assistant scientist to associate scientist to senior scientist, the salary increases until a senior scientist in my position is making between $90,000 - $150,000. How many hours do you work per week? The number of hours I work varies between 8 hours/day to as much as 20 hours/day. I try to work only as long as I'm being efficient, but sometimes on research cruises there is no choice. Tell us about your research and the types of things you do. My interest is in bioluminescence—how and why there are so many creatures in the ocean that make light. To answer my questions, I have had to develop special instruments that can measure and record the light. What is the most fascinating thing you have ever seen or done? The first deep dive I made was in the single-person submersible Wasp. When I turned out the lights and saw all the bioluminescence that seemed to be everywhere I looked, I was hooked. The experience changed the course of my career. What are the personal rewards of your work? I love learning new things and I love exploring. Those would be rewards enough, but the icing on the cake is the amazing light show I see every time I make a dive in a submersible and turn out the lights. It still thrills me. How does your work benefit the public? In order to be good stewards of the ocean, we have to know how many animals there are, how they are distributed, and how they behave. A lot of my research revolves around answering these questions with innovative technological developments. And now at ORCA, the organization that I helped found, we are developing technological solutions to ocean conservation challenges. Some of these involve the use of bioluminescence as a means of monitoring ocean health. What else could someone with your background do? I love research, but I also enjoy teaching and writing and have even written a couple of children’s books about bioluminescence. What sparked your initial interest in ocean sciences? When I was 11 years old I got to visit Fiji with my parents and I was fascinated by all the amazing creatures I saw on the reef—things like giant clams and blue starfish and lionfish. Who influenced you or encouraged you the most? My parents loved learning and they passed that love on to me. Looking back, was there anything you would have done differently in your education or career journey? I would have taken more advanced mathematics. What obstacles did you encounter along the way? Funding is always a challenge, but with persistence, I have generally been able to find support for the projects that I think are important. I either roller blade or bicycle everyday and I also enjoy kayaking and cooking. Art, archeology and marine biology. Tropical marine biology when I was a junior in college. Laboratory Technician at Harvard Medical School for two years after completing my undergraduate degree. PhD in neurobiology studying the electrophysiology of a bioluminescent dinoflagellate. I had a postdoc lined up in membrane biophysics working in a top lab in Madison, Wisconsin, but then was offered the opportunity to dive the single-person submersible Wasp and it completely changed the course of my career. There was no such thing as a career path in bioluminescence but it didn't matter—I was hooked. Co-holder of the patent on the instrument that the U.S. Navy considers the standard for measuring bioluminescence in the world's oceans. Published over 75 peer-reviewed scientific papers and participated in over 65 ocean research expeditions, 39 as chief or co-chief scientist. Certified research pilot for single-person submersibles, including Wasp, Deep Rover, and Deep Worker. Inducted into Women Diver’s Hall of Fame, 2005. Named a MacArthur Fellow by the John D. and Catherine T. MacArthur Foundation, 2006. A featured article titled 'Why do so many animals in the open ocean emit light'.